*As Oprah gracefully matures in front of television audiences, she continues to reveal more of herself and her intimate thoughts. In a candid interview recently she confessed she isn’t doing enough. Especially when it comes to her fledgling network, OWN. 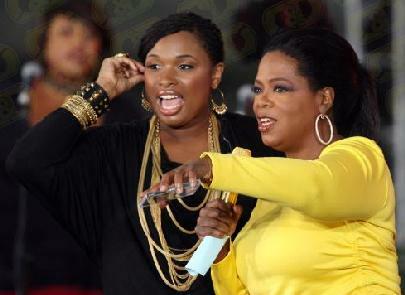 And while discussing OWN’s reality show “Oprah Behind the Scenes,” she brought up the Jennifer Hudson episode and the drama around it. It seems all was going well. Hudson was even at the Harpo studio for a soundcheck which happened during a week of severe snowfall. After she was done, she flew down to Texas for a gig, but was then delayed returning to Chicago the next morning for her final Oprah Show appearance, which upset the queen of daytime and her staff. Damn, it was an unforeseen circumstance. GTF over it!!! I don’t watch this chick for a reason and have no intention in checking for her network. She just rubs me the wrong way. I hate not rooting for one of our own but, in her case, I just can’t do it. im not sure why she launched the network if she was no prepared to put her full force behind it. did she think it would automatically leave the nest and start flying? Oprah has high standards for herself and those that work with her. You don’t reach her level of success without holding to your standards. She has contributed greatly to creating positive forces in this world. I for one will miss her 4:00 serving of”a better world”. I remain awfully proud and inspired by her.